Creativity International Recognizes TFI Envision with Two Bronze Awards | TFI Envision, Inc.
TFI Envision, Inc. designed a compact sales kit for the spray version of the number one selling truck bed liner product, Herculiner, which was previously only available in a roll-on form. 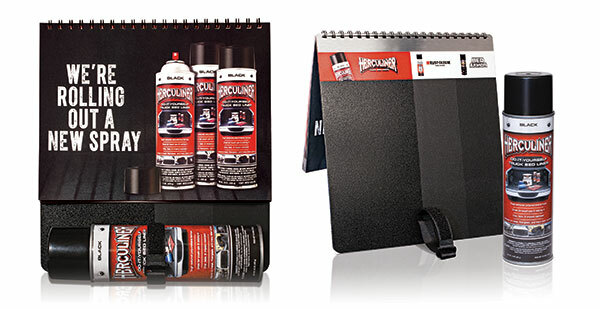 The portable presentation includes a full color, 12 page custom flipbook sales presentation wire-o-bound to an aluminum back page that was ‘sprayed’ with the actual Herculiner product, and two competitive products sprayed next to it, for a literal side by side comparison. This clearly showed the superiority of the Herculiner product over the competition. The aerosol can product was attached to the bottom of the aluminum backer page with a Velcro strap to show prospects the actual product. In additional to developing the brand identity, TFI Envision, Inc. developed the application of the new Building One Community™ brand identity to include versions of the logo for various usages (1 color, full color, reverse), business material applications (stationery), interior and exterior signage. The cohesive program allows the icon to be used as part of the logo and as an element in various pieces. The brand standards manual provides the necessary information – logo usage, font and color guidelines, image usage, etc. – to effectively maintain the look and feel of the brand throughout all materials. Creativity International Design Awards is one of the longest running, independent advertising and graphic design competitions. Open to both students and professionals from around the world, Creativity International Awards is judged by a rotating panel of advertising and design professionals. Winning entries are selected for their quality of art, or their advertising impact, or both.